UNC Charlotte Police & Public Safety is a fully authorized state police agency, providing both police and security services to a campus of 30,000 students, faculty and staff. The Department is comprised of two divisions--Patrol and Support Services--with a special emphasis on community oriented policing. 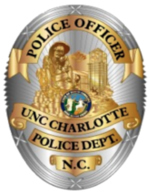 The UNC Charlotte Police Department collaborates regularly with the Charlotte Mecklenburg Police Force and other regional law enforcement agencies.